A Map of the Extremity of Cape Cod Including the Townships of Provincetown & Truro: A Chart of Their Sea Coast and of Cape Cod Harbour, State of Massachusetts. An exceptional discovery, this Major James Duncan Graham's scarce wall map of Provincetown and the tip of Cape Cod. 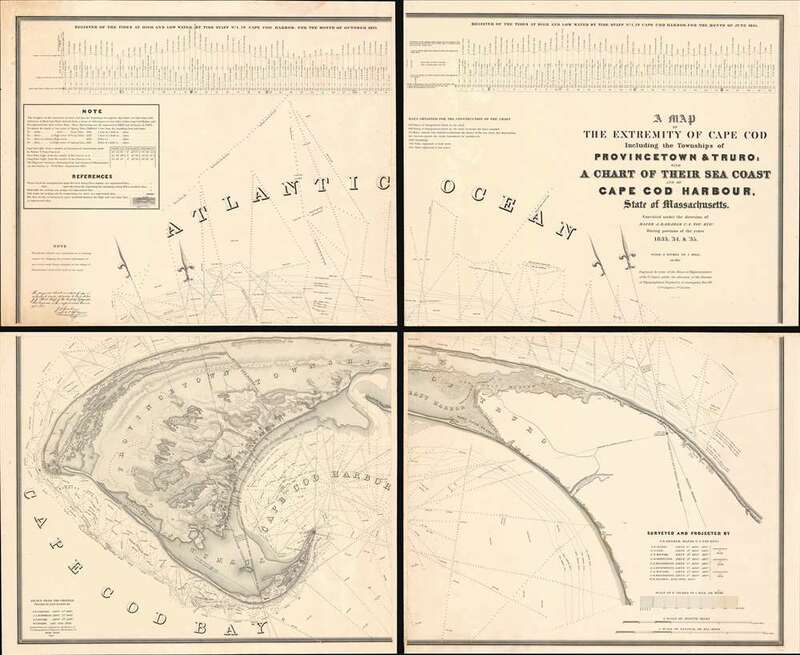 This monumentally proportioned map consists of four panels which, if joined, would produce an enormous wall map covering the northern extremity of Cape Cod from roughly Truro, to Provincetown and the Long Point Light House. It was issued in 1836 based upon survey's conduced under the direction of U. S. Topographical Engineer J. D. Graham between 1833 and 1835. At the time of issue, and for a long time afterwards, this was the definitive map of the Provincetown area and the surrounding waters, said to have been used by, among many others, Henry David Thoreau when writing Cape Cod. The detail throughout is extraordinary, with thousands of depth soundings and exceptional inland detail complete to the level of individual buildings. Relief shown by hachures and spot heights. Depths shown by isolines and soundings. Includes notes, references, and 2 diagrams of the tides at high and low water in Cape Cod Harbor for the months of Oct. 1833 and June 1835. This map was issued by the Army Corps of Topographical Engineers and engraved in Washington D.C. by William J. Stone. It was prepared for presentation to the 25th Congress, 2nd secession. Many of the cartographers who produced the map under Graham's direction, including Graham himself, J. N. Macomb, J. E. Johnston, A. A. Humphreys, W. R. Palmer and J. E. Henderson, went on to become major figures in the exploration and mapping of the American West. Major James Duncan Graham (April 4, 1799 - December 28, 1865) was an American topographical engineer active with the Army Corps of Engineers in the first half of the 19th century. Gram was born in Prince William County, Virginia to a family of Scottish descent. Graham studied at West Point and entered the army as a Third Lieutenant of the Corps of Artillery in 1817. He is reported to have embodied the "highest accomplishments of the polished gentleman and distinguished scholar." During his long career with the Topographical Engineers Graham participated in many of the most important events of the 19th century, ranging from the Mexican American War and the Civil War, to surveying the Texas Boundary, producing the first scientifically accurate survey of Cape Cod, mapping the Great Lakes, and the survey of the Mason Dixon Line. Graham died in his home in Boston of sudden heart failure at 66 years of age. Very good. Some minor marginal repairs. Light burn do to acid in ink. Size noted is if joined.